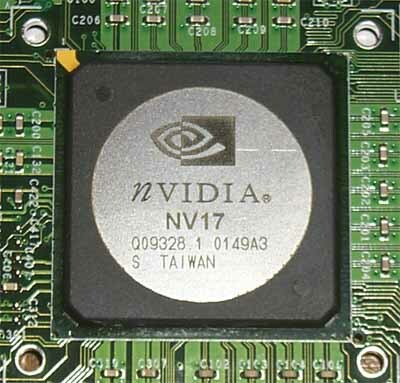 Not so long ago we published a review on top models of the NVIDIA's new line known as GeForce4. The announced models include cards on the chip codenamed NV25 (for enthusiasts), as well as on the NV17 (mainstream, budget and mobile solutions). In the GeForce4 review we mentioned the cheapest cards of the new line and now I'd like to take a closer look at them. Attention! Before reading the review it's recommended that you read the previous articles on NVIDIA GeForce3 (NV20), ATI Radeon 8500 (R200) and NVIDIA GeForce4 Ti. 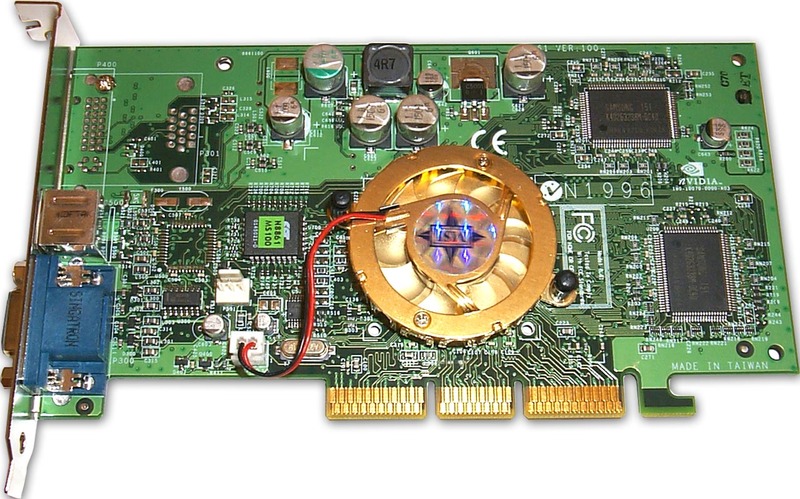 GeForce 4 MX460 - 300 MHz core, 64 MBytes 275(550) MHz 128bit DDR memory. 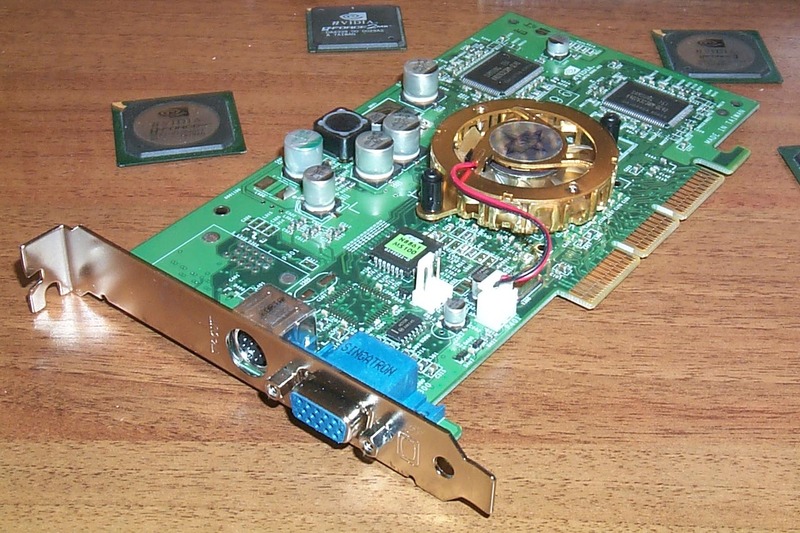 GeForce 4 MX440 - 270 MHz core, 64 MBytes 200(400) MHz 128bit DDR memory. 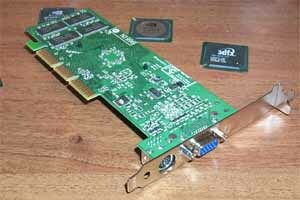 GeForce 4 MX420 - 250 MHz core, 64 MBytes 166 MHz 128bit SDR memory. GeForce4 MX doesn't and won't support pixel shaders. GeForce4 MX will have MPEG2 hardware decoder and dynamic power management system, and the NV25 does not. GeForce4 MX has only two fill pipelines, and GeForce4 Ti - four. 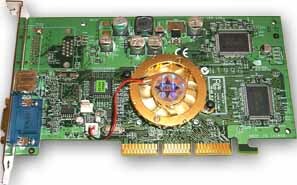 GeForce4 Ti has a superscalar (dual) T&L unit, GeForce4 MX has a single one. 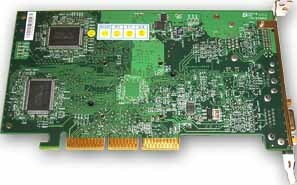 GeForce4 Ti and GeForce4 MX have similar memory controllers (2x-channel one of the GeForce4 MX and a 4-channel one of the GeForce4 Ti). Both chips have the same systems for increasing the memory effective bandwidth (Z buffer compression and fast Z clear, MSAA, HSR). GeForce4 MX has 2 integrated LCD-panel controllers. Both chips have two independent RAMDACs, CRTC controllers, and integrated TV-Out and DVI interfaces. 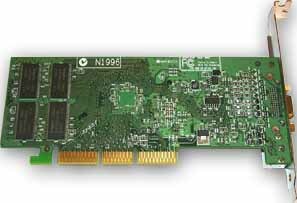 We thus have some kind of a hybrid of the GeForce2 architecture (without pixel shaders and advanced 3-level anisotropic filtering) and of the GeForce3/4 one (MSAA with Quincunx and 4xS, memory bandwidth saving technologies). 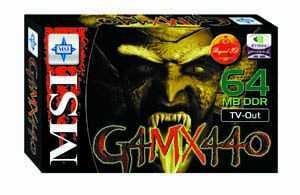 In these terms GF4 MX series meet the specs and that's why chips/cards got this name. Besides, NVIDIA decided to replace all the product range (from M64 to GF3) completely and GF4 name is also good to make this move more noticable. 2 independent CRTC controllers. Flexible support of all possible modes and of output of two frame buffers independent in resolution and in contents onto any accessible signal receivers. 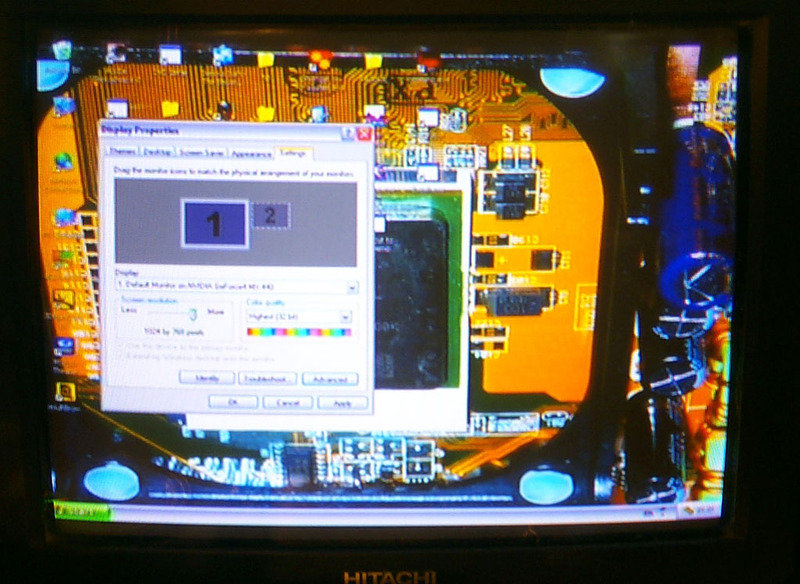 2 normal 350 MHz RAMDACs integrated in the chip (with a 10bit palette). Integrated TDMS transmitter (for DVI interface). MSAA is supported, and now 2x AA and Quincunx AA modes will cause much less performance drop. The Quincunx AA is improved (positions of sample fetching are shifted). A new AA method appeared - 4xS. Improved separate caching system (4 separate caches for geometry, frame buffer and Z-buffer). Improved lossless compression (1:4) and fast Z clear. Improved hidden surface removal algorithm. The above changes are rather evolutionary rather than revolutionary as compared with the previous NVIDIA's product (GeForce2 Ti/GeForce2 MX400). And now take a look at the summary table of the key characteristics of the chips and cards tested today. 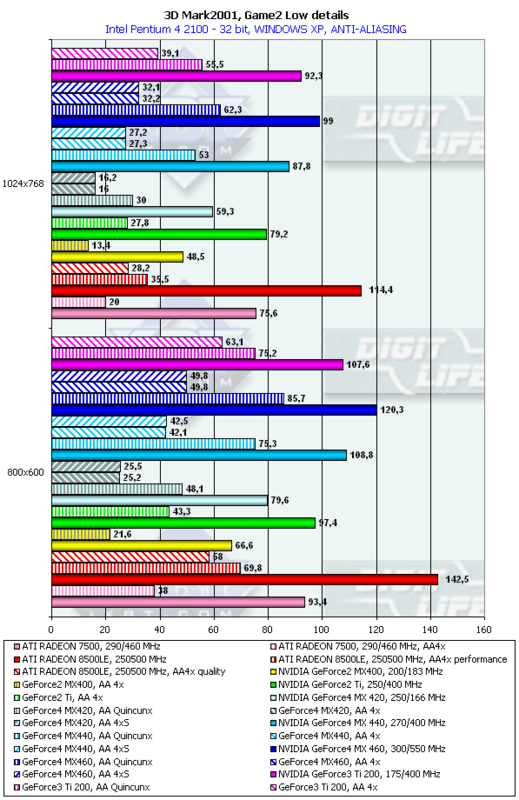 Keep in mind that in the nearest quarter the ATI RADEON 8500 will be a main competitor of GeForce4 MX 460 based cards (though the GeForce2 Ti and GeForce3 Ti 200 shouldn't be neglected), and the ATI RADEON 7500 will compete against a weaker GeForce4 MX 440. 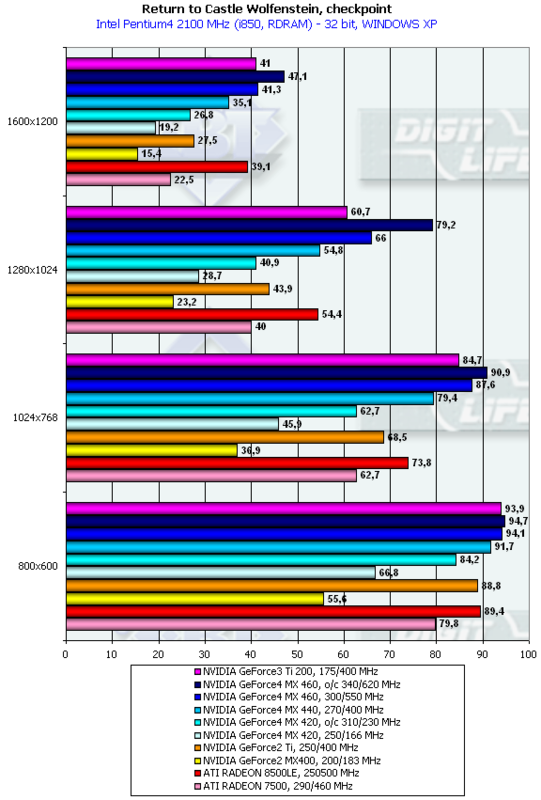 GeForce4 MX has a higher clock speed of the core and memory than the GeForce2 and RADEON 7500 models (except MX 420). 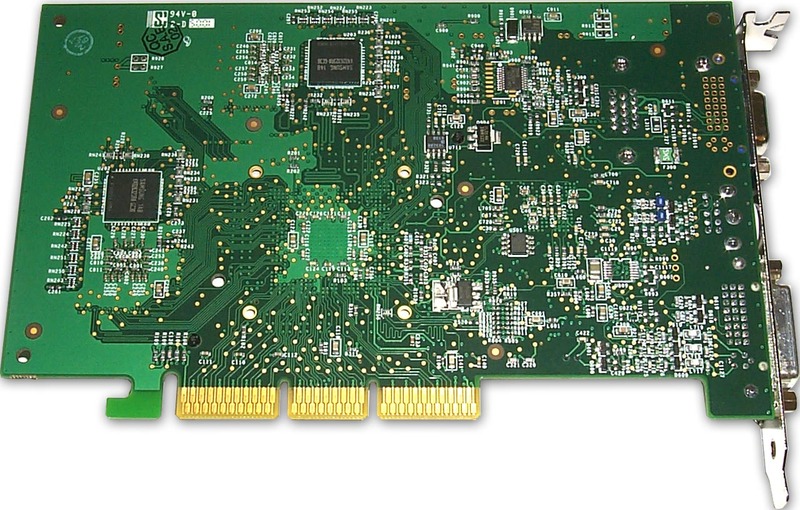 GeForce4 MX has 2 normal 350 MHz RAMDACs integrated into the processor, unlike the GeForce2 MX where the dual-head cards had the secondary RAMDAC external (270 MHz). Organization of the internal architecture of the GeForce4 MX is close to the GeForce2 MX - 2 fill pipelines with two texture units on each. The Radeon 7500 has a similar architecture too. The results of their operation can't accumulate, that is why it's impossible to combine up to 4 textures in a single pass like in case of the NV25/NV25. GeForce4 MX doesn't support pixel shaders as their realization is too expensive as far as the die's surface is concerned. GeForce4 MX is able to process vertex shaders, though less efficiently than the NV20/NV25 can. The T&L of the latter consists of two identical completely programmable units, and it is possible that one such unit was integrated into the NV17 as a base T&L. Or the drivers have their own effective emulation of vertex shaders. 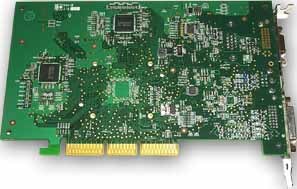 GeForce4 MX got a new more efficient memory controller that is why the core is not anymore such strongly dependent on the memory bandwidth; it should be beneficial, especially for the junior MX 420 in comparison to the previous GeForce2 MX400. Multisampling didn't change as compared with the GeForce3 - the same 2..4 samples which none of the ATI's products is able of. 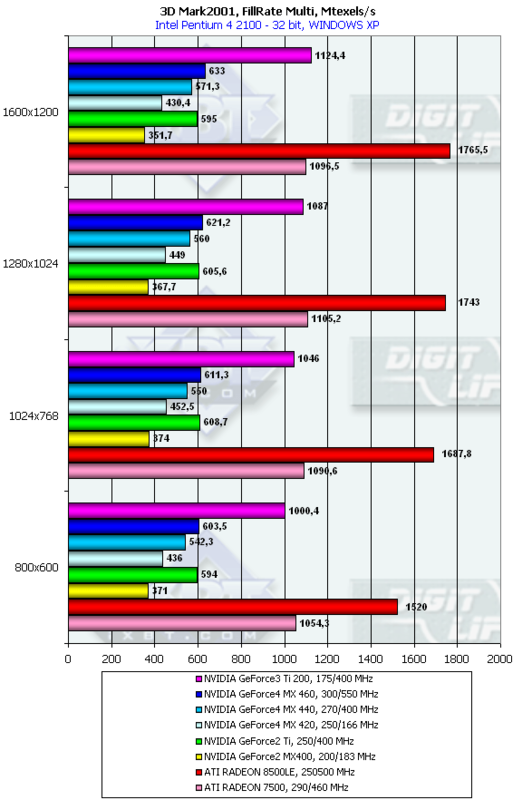 Realization of the anisotropy of the GeForce4 MX and RADEON 7500 is different. This time the Canadian product beats its competitor as it supports a deeper anisotropy degree and wider range of its settings. Unfortunately, the GeForce4 MX doesn't differ from the GeForce2 family - just a double sampling is not enough. GeForce4 MX doesn't support 3D textures. 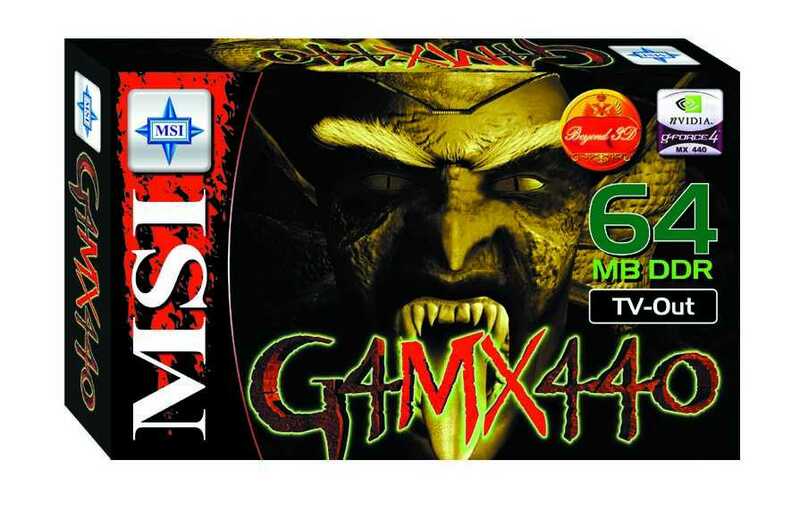 Now let's turn to the video cards from MSI which are based on 3 versions of the GeForce4 MX: GeForce4 MX 460, MX 440 and MX 420. All the cards are finished products and will come onto the market without any changes. 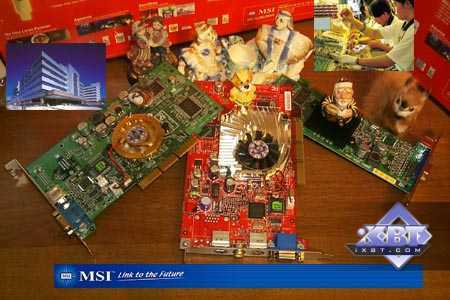 Some of the cards follow the MSI's proprietary design. 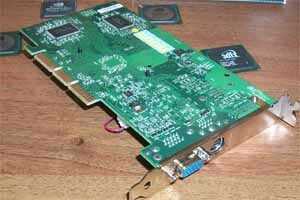 The card has an AGP x2/x4 interface, 64 MBytes DDR SDRAM located in 4 chips on the right and back sides of the PCB. 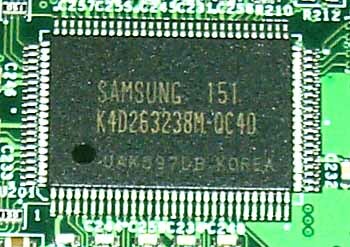 The card is equipped with memory chips of the BGA form-factor from Samsung. Access time is 3.3 ns which corresponds to 303 (606) MHz. The card uses memory chips in a new BGA package. 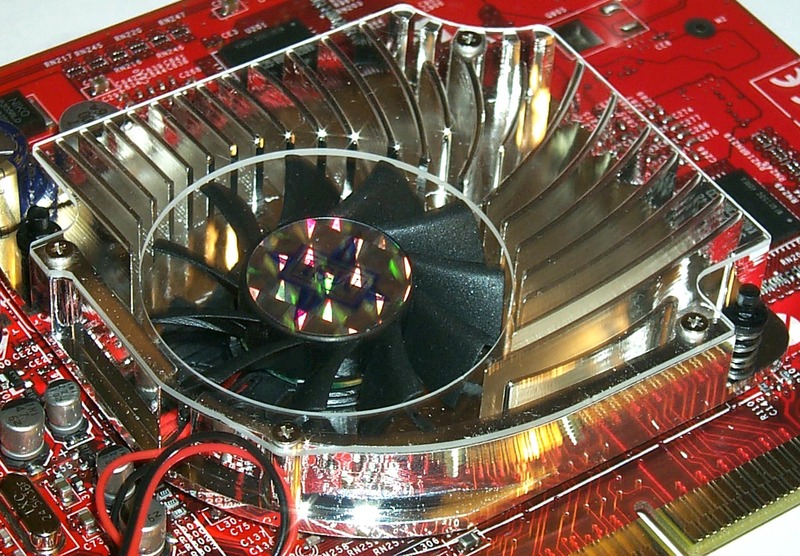 This form-factor provides more effective cooling of chips and memory. 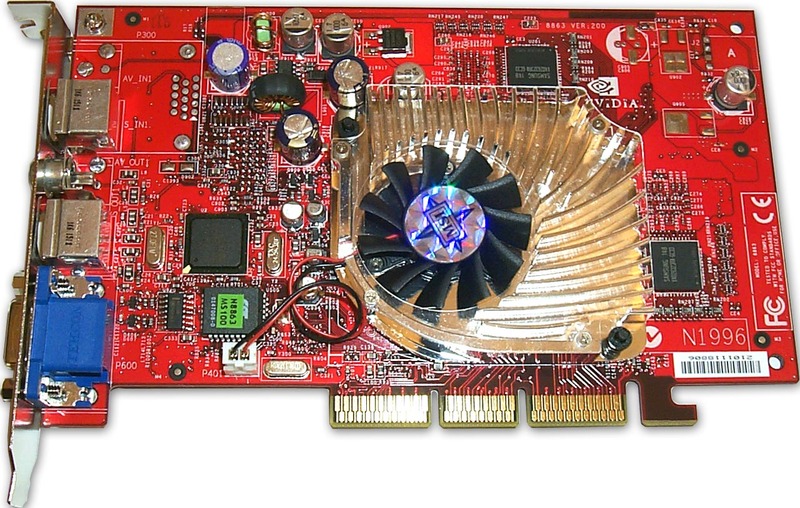 However, for the GeForce4 Ti it refers to its rated frequency. 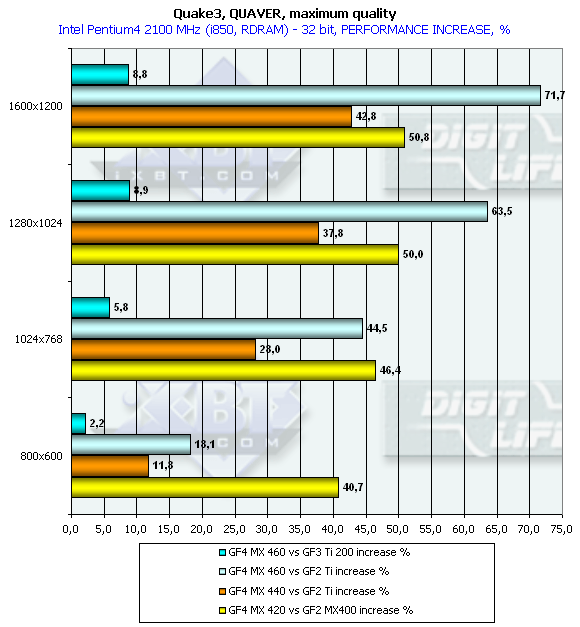 The MSI GF4MX460 has faster chips than required as the rated frequency of the card is 300/275 (550) MHz. The MSI's engineers gave up the second head in favor of the VIVO. Instead of the 3.6ns memory the MSI's card has 3.3ns one. 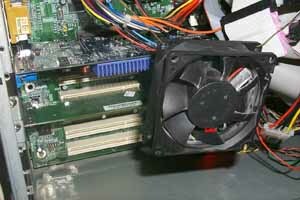 GeForce4 cards have unusual coolers. The MSI GFMX460 has a similar one which differs only in a lid and in color. The sound it produces indicates that it's not recommended to put a plastic lid on such device because of vibration. The card ships in a retail package, and it comes with a great suite of software including 4 games and a DVD player. As expected (due to the fast memory), the card easily reached 350 (700) MHz of the memory and 340 MHz of the chip. overclocking depends on the definite sample, and you shouldn't generalize the results of one card to all video cards of this mark or series. 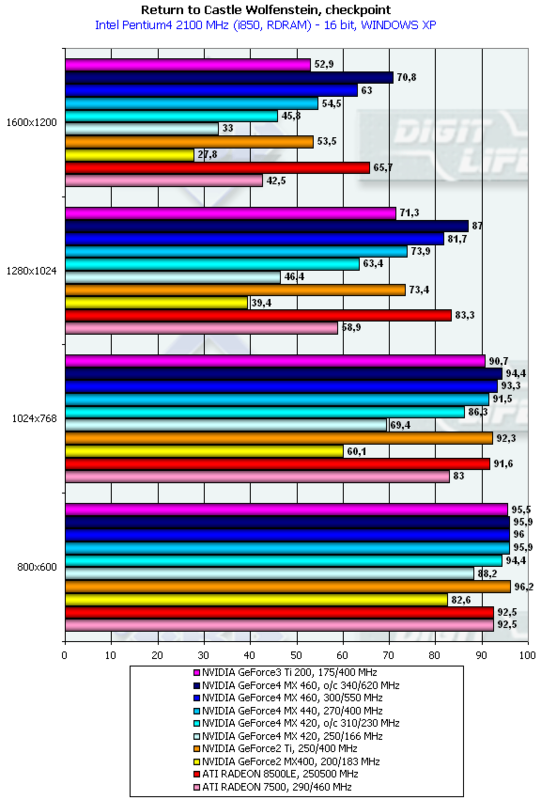 The overclocking results are not the obligatory characteristics of a video card. 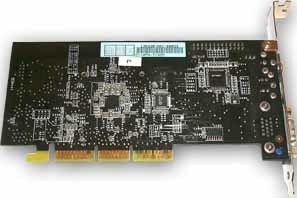 The card is equipped with memory chips from Samsung. Access time is 4 ns which corresponds to 250 (500) MHz. 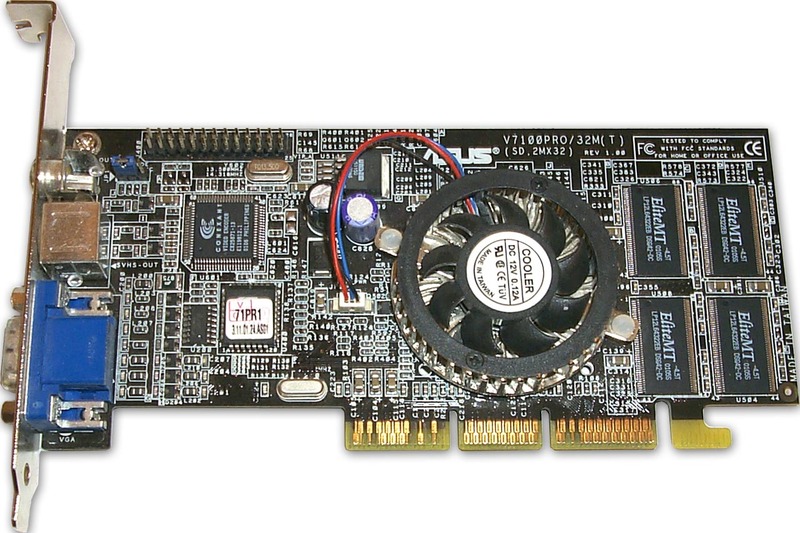 Again, the card has faster memory chips than specified (5ns, 200 MHz). But the frequencies comply with the NVIDIA's recommendations - 270/200 (400) MHz. The design of the card corresponds to the reference one. Unfortunately, it lacks for two connectors for monitors, that is why the nView doesn't work. 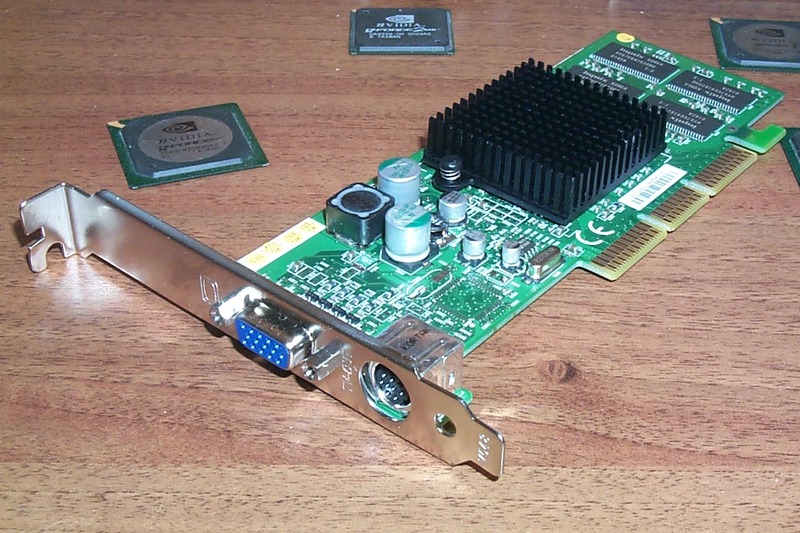 The VGA connector is seated in the lower part, where the reference card has DVI. 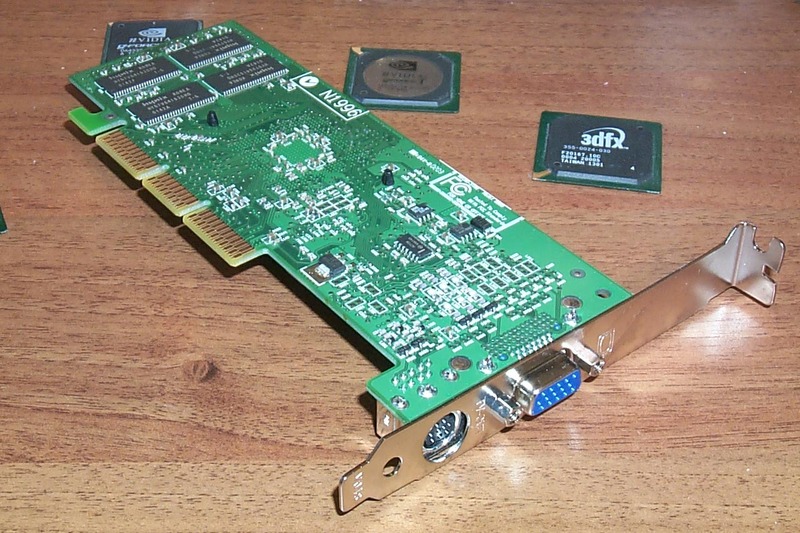 The card has a TV-out with an S-Video connector. The GPU has an ordinary cooler, but it looks stylish as well. 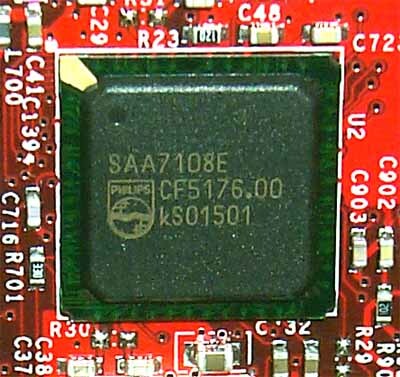 On both cards this chip located under the cooler shows the chip's codename - NV17. 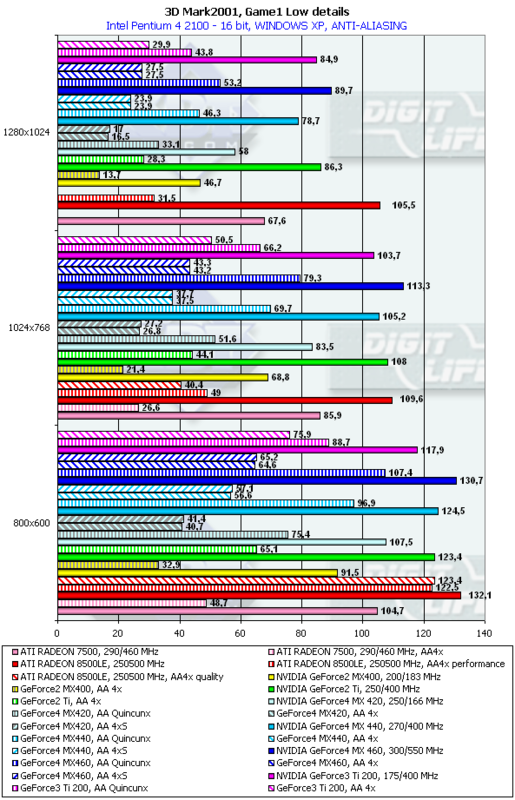 I think it makes no sense to overclock this card as its performance won't be higher than that of the MX460 even of the rated mode (because of the memory); in all other respects the cards are identical as far as DDR memory is concerned. The card has an AGP x2/x4 interface, 64 MBytes SDR SDRAM located in 4 chips on the right and back sides of the PCB. 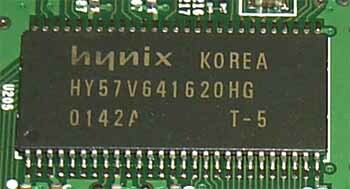 The card is equipped with memory chips from Hynix. 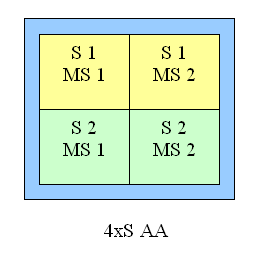 Access time is 5 ns which corresponds to 200 MHz. 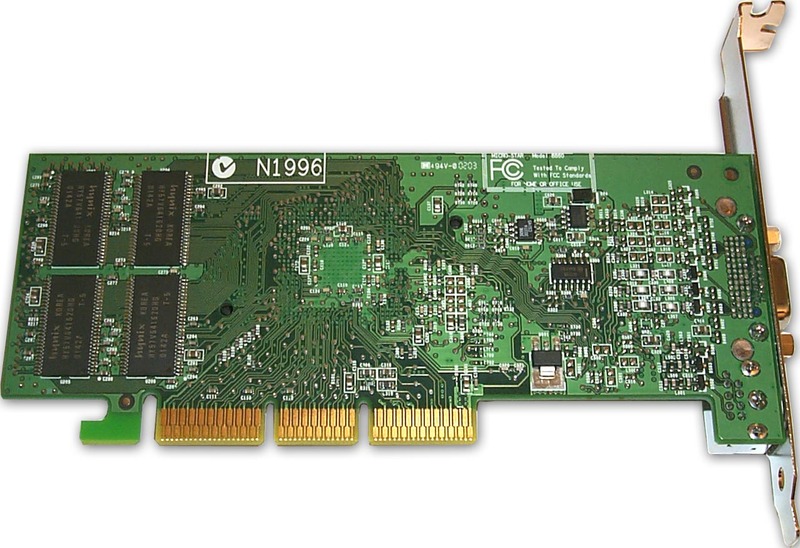 Again, the card has faster memory chips than specified (6ns, 166 MHz). However, the frequencies comply with the NVIDIA's recommendations - 250/166 MHz. 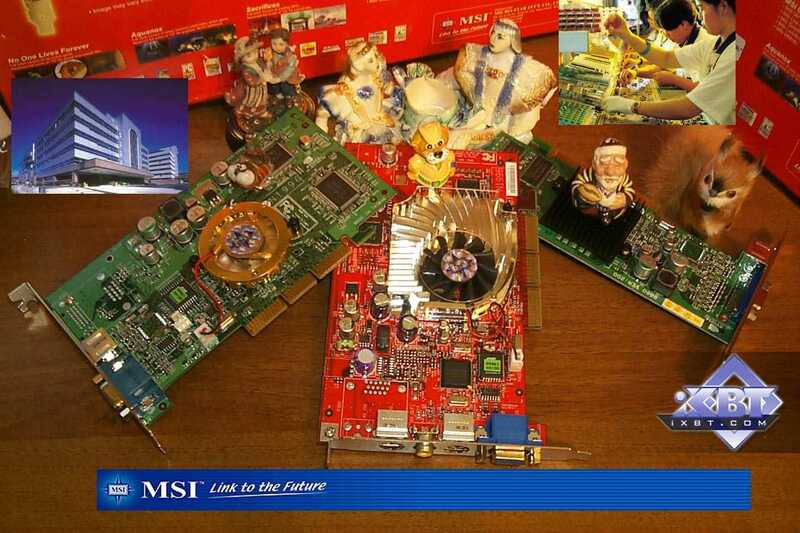 The design of the MSI GF4MX420 corresponds to the reference one and is similar to the GeForce2 MX/MX400 cards. 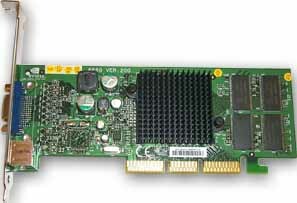 That is why we will compare it with the ASUS AGP-V7100/Pro reference card. Again, it is impossible to test the nView with two heads. 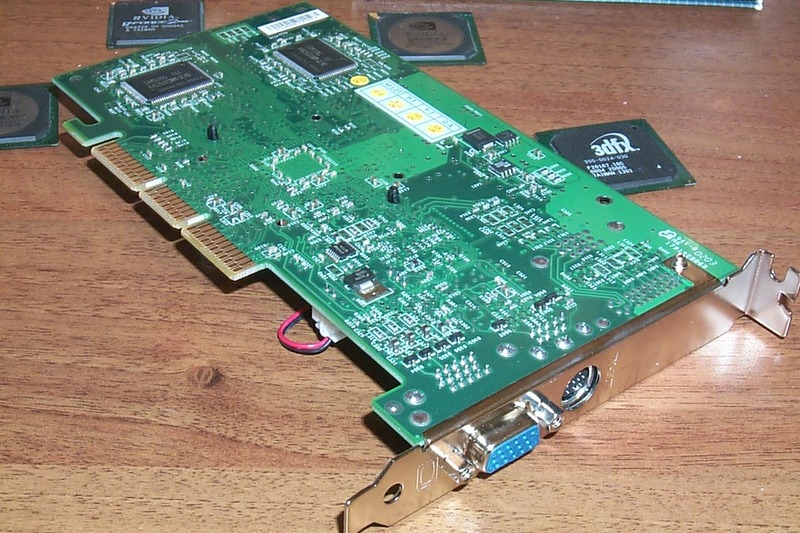 The card has a TV-out with an S-Video connector. These cards have much in common. First of all, it concerns positions of the memory modules and a low-profile form-factor. 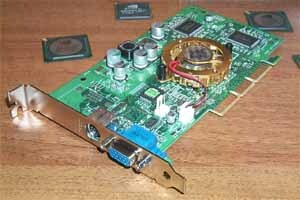 Besides, in the very beginning some manufacturers equipped their GeForce2 MX cards with heatsinks without fans (this is what we can see on the GeForce4 MX420). Moreover, some MX440 cards are also deprived of fans, and under the cooler one can see the marked GPU. Besides, the chip's lid is plastic. And the S suffix, as we found out, marks the weakest chip in the line. The card ships in a retail package, and it comes with several games and a DVD player. 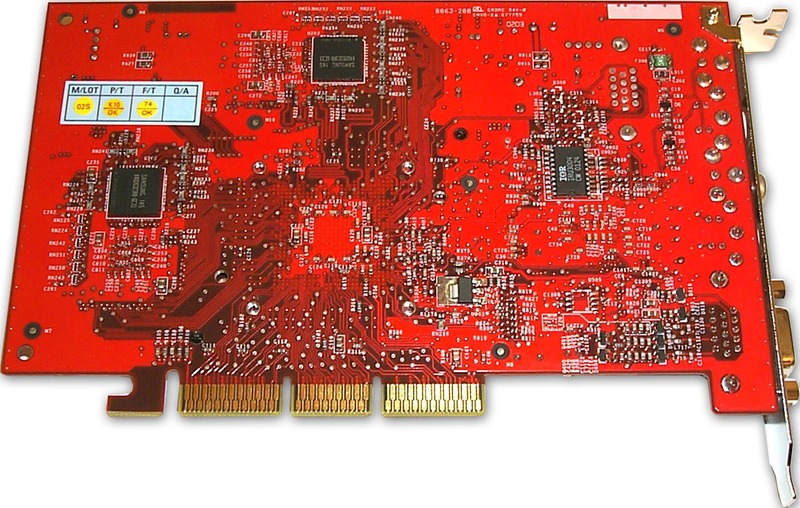 The card has a slow SDR memory which will be a bottleneck for the performance. The new memory controller and optimization of operation with the Z buffer will definitely help to speed up (as compared with the GeForce2 MX400), but the memory overclocking will be more considerable to reveal the card's potential than that of the GPU. This sample worked stably at 310/230 MHz which is rather good taking into account the 5ns memory. In the tests we used NVIDIA's drivers v27.20 and 27.30. VSync was off, S3TC was activated. 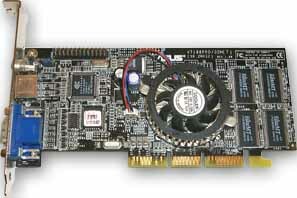 Manli RADEON 8500 (RADEON 8500LE, 250/250 (500) MHz, 64 MBytes, driver 6.032 (Windows XP)). The GeForce4 MX is going to crowd out the GeForce2 series, but according to the prices, the top MX460 will cost similar to the GeForce3 Ti200 and ATI RADEON 8500LE, that is why we included these cards in the tests as high-level competitors, and the GeForce2 MX400 will be its low-level one. In our GeForce4 Ti you can look at the nView operation when forming several desktops. The multiprocessor support is not provided, that is why there is nothing more to speak about in this part. 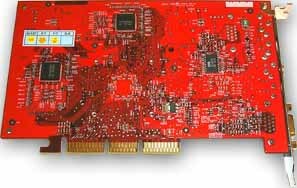 What I really want is to test the new MPEG2 decoding engine of the GeForce4 MX, however there are still no players knowing it. 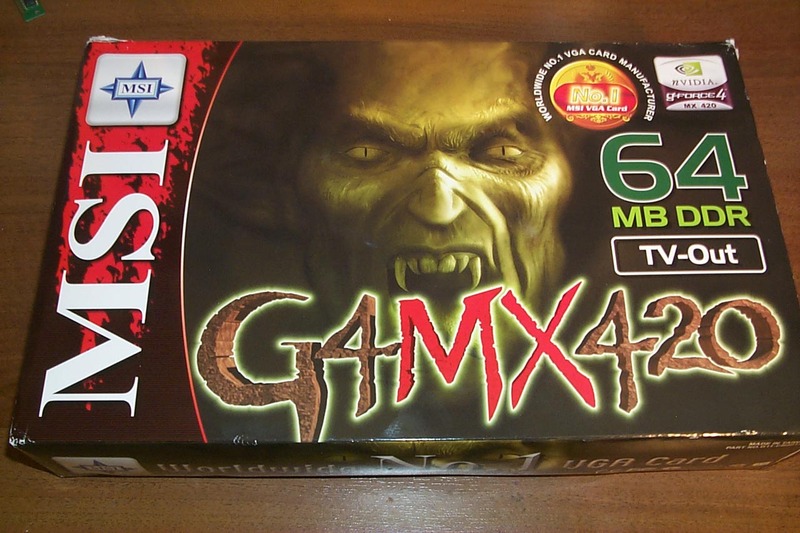 That is why we have no choice but to wait for updates of the popular DVD players (PowerDVD, WinDVD) and for new players able to lay decoding on the GeForce4 MX. Image quality in 2D is excellent. You can work comfortably in 1600x1200 at 75 Hz on the MX460 and MX440 cards. 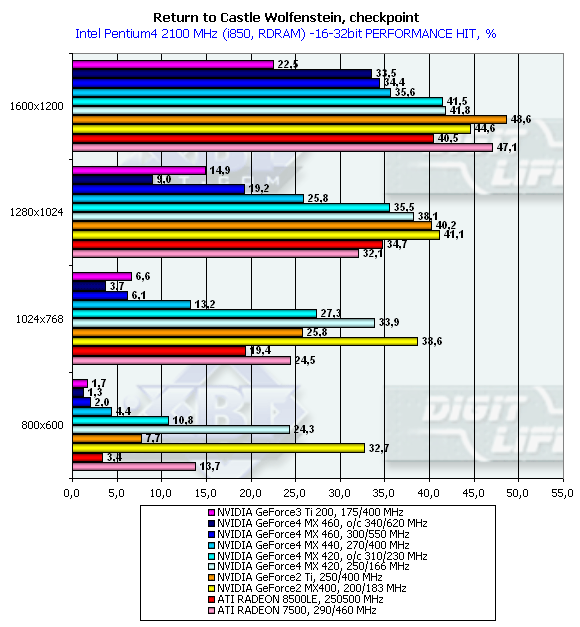 The MX420 performs a little worse but at 1280x1024x100 Hz all the cards demonstrated nice results. Remember that estimation of 2D quality is subjective and depends on a certain card and on compatibility of a video card and a monitor. 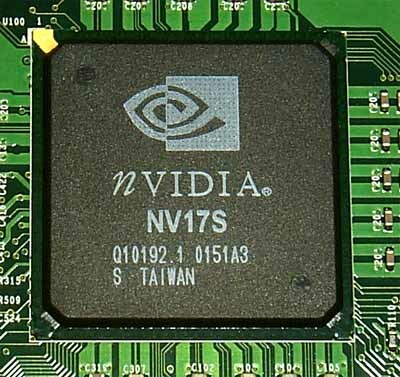 The NV17 looks like a normal hardware executor of vertex shaders. Soon we will find out whether the drivers have their own program emulation or the chip contains a normal shader geometrical unit. 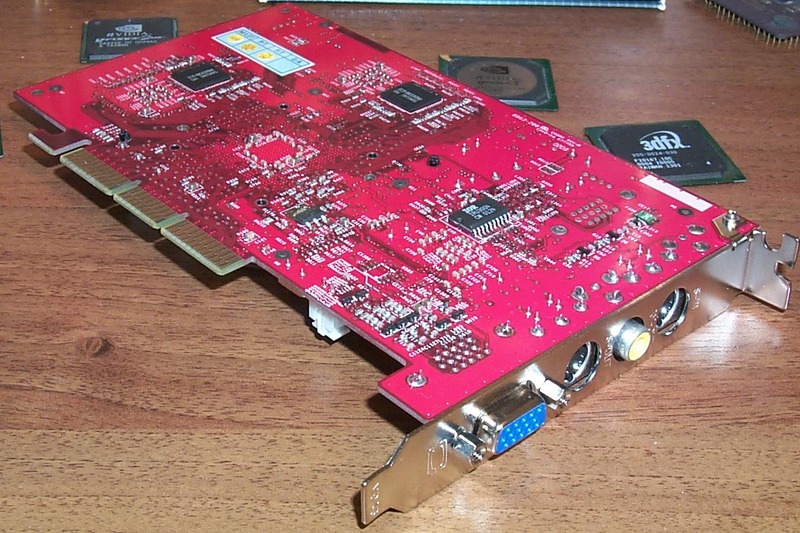 The RADEON 8500LE working at 250 MHz and having 4 pipelines shot forward. 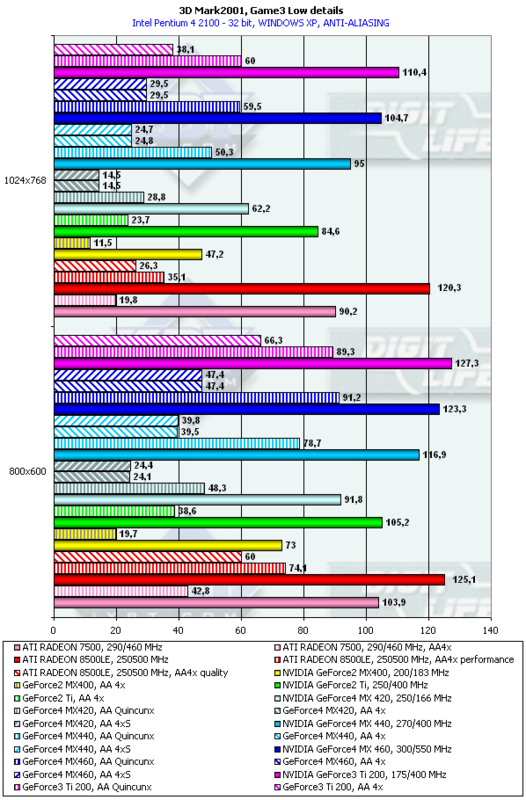 It is interesting that the overclocked GPU of the 2-pipeline MX460 (up to 300 MHz) helps it beat the 4-pipeline GeForce3 Ti 200 working at 175 MHz. Such victory won't be possible without a wider memory bandwidth - the 550 of the MX460 against 400 of the Ti200. The capability to use 4 textures in a single pass helped the GeForce3 Ti 200 to outdo the MX460 which is able to use just 2. 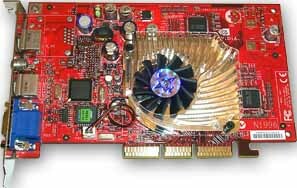 The most of the cards which have a limiting memory bandwidth couldn't win in 32-bit color just at the expense of the GPU. 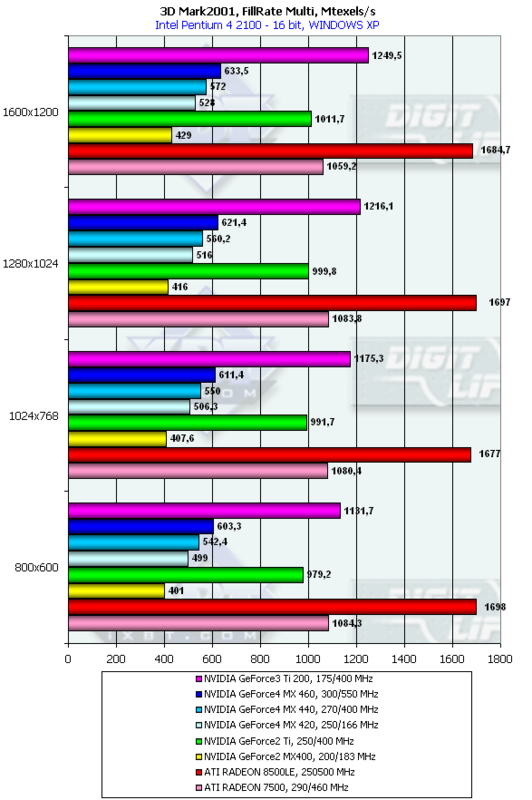 The MX460 goes shoulder to shoulder with the RADEON 8500LE (in low resolutions), and the GeForce3 Ti 200 lags far behind because of a low speed of its GPU and, therefore, of its T&L unit. 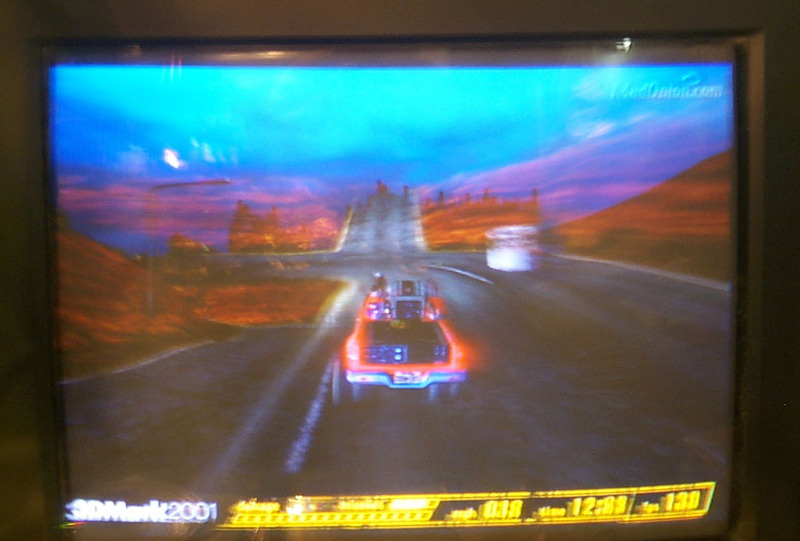 The situation is close to the previous one, only the RADEON 8500LE shoots forward as its operation with 8 light sources is better than that of its competitors (it is known that the NVIDIA chips pay for each added light source by a considerable performance decrease, it is caused by emulation of the fixed T&L with a special shader microcode. 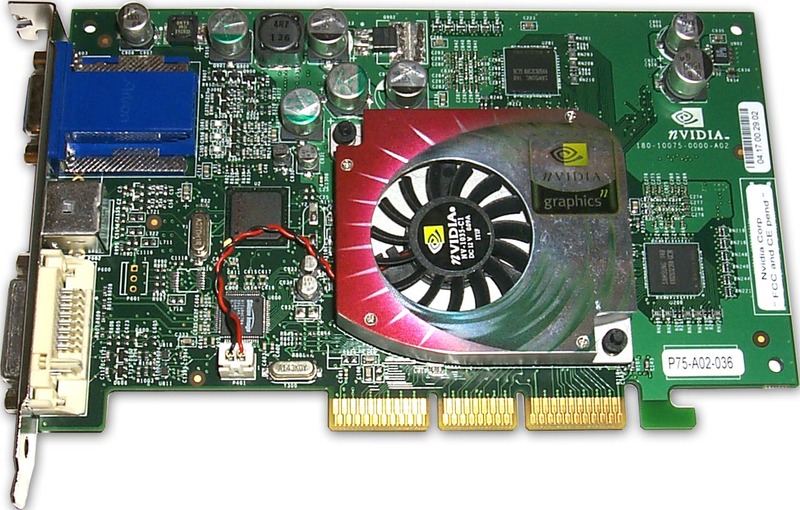 The GeForce3 Ti 200 becomes a leader as it has excellent optimization for operation with bump mapping. Even the RADEON 8500LE falls behind it. 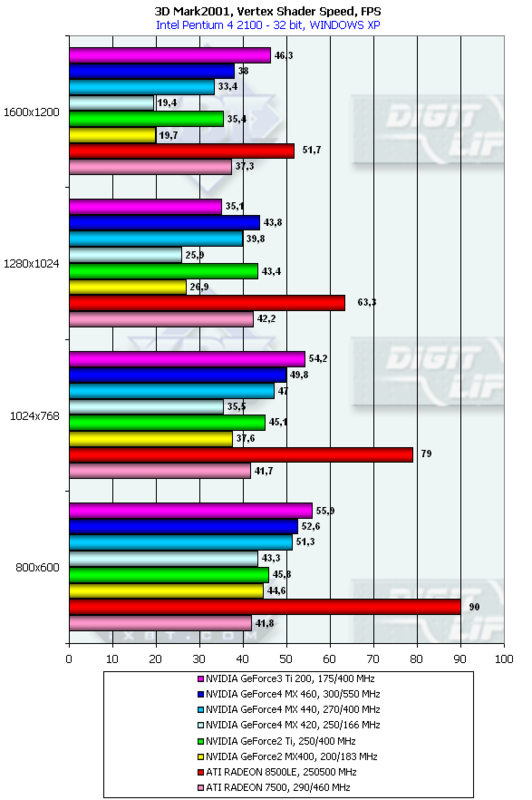 As the resolution grows up the RADEON 8500LE becomes weaker because it is limited by its fillrate; the speed of the GeForce3 Ti 200 falls down much slower. Nevertheless, the RADEON 8500LE is an absolute champion in this test. 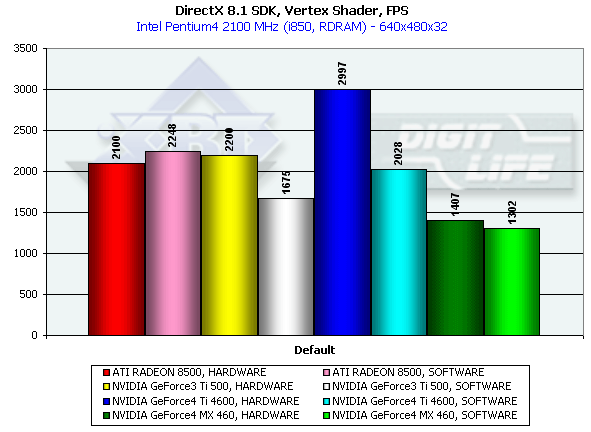 It should be noted that the results mainly depend on the fillrate rather than on the performance of vertex shaders! 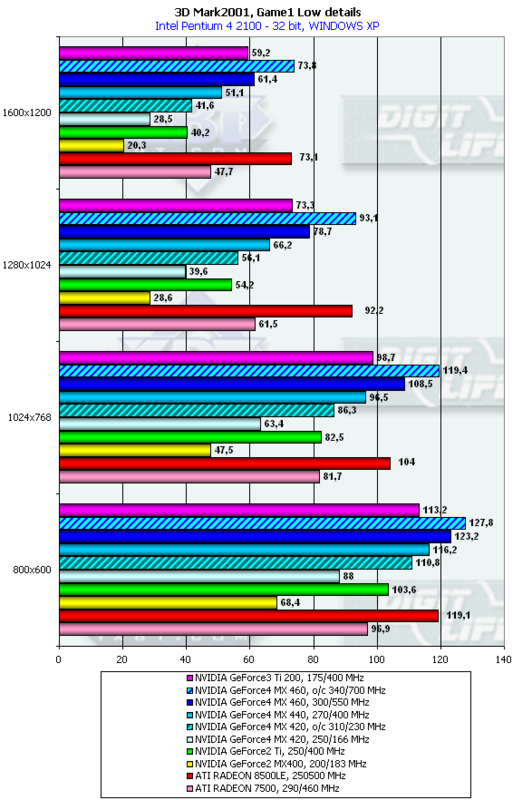 The RADEON 8500LE is leading again. As you can see, the RADEON 8500LE turns out to be a leader in almost all synthetic tests as the card is well balanced, has some advantages in its GPU structure (4 pipelines, pixel and vertex shaders, accumulation of results of texture units etc.) and is equipped with a fast 250 (500) MHz local memory. This card has actually to be compared not with lite versions of the GeForce4, but with normal GeForce3/4 cards, but the price policy of ATI and its partners is close on the heels of NVIDIA & Co. 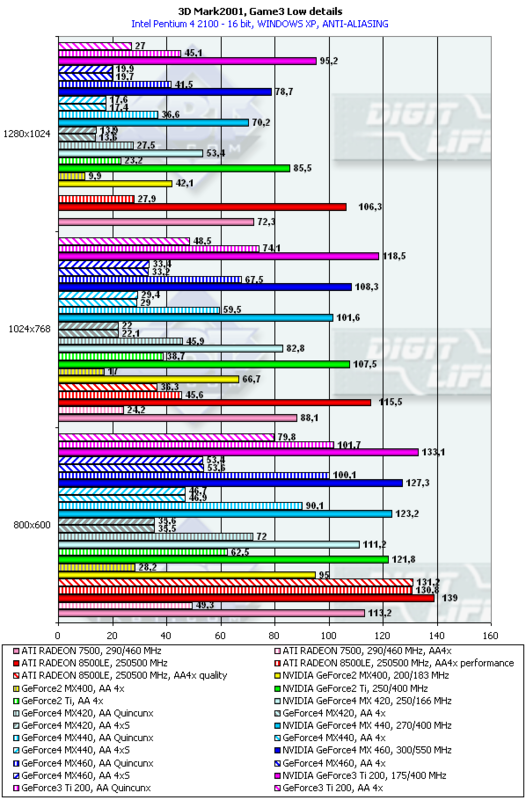 The summary tests indicate that the RADEON 8500LE is a leader and it is followed by the GeForce3 Ti 200. 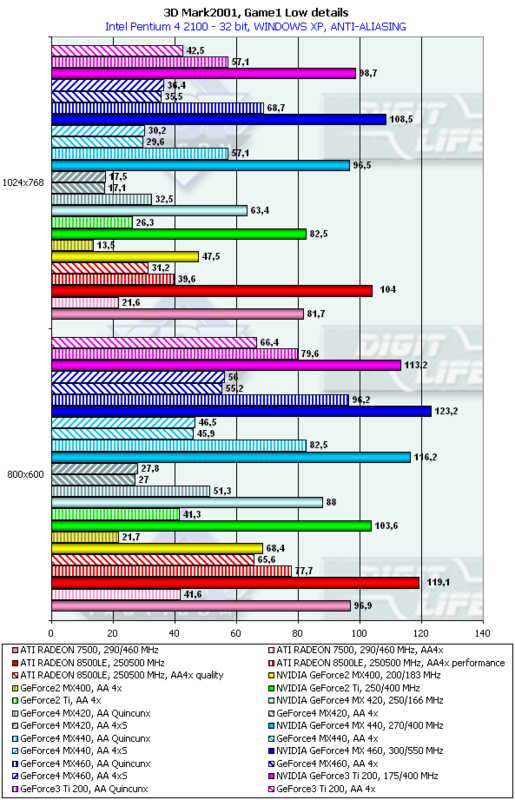 The new GeForce4 MX line takes just the third and lower places. 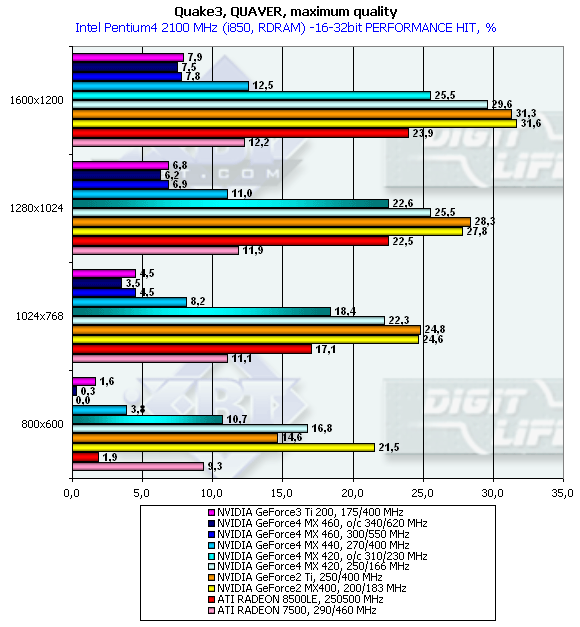 The 3DMark2001 includes 4 gaming tests, three of which are implemented at low and high detailing graphics levels. High detailing means that the processor and video accelerator are much more loaded with additional effects and polygonal complexity of the scenes. 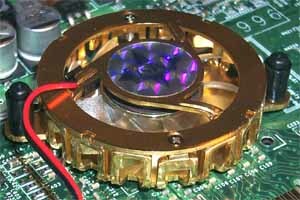 However, at a high detailing level in these tests the performance becomes limited by a CPU frequency in case of a highly efficient accelerator. The GeForce 4 proved it. And we had to exclude High Detail tests. The MSI GF4MX460 outscores the GeForce3 Ti everywhere and sometimes it outruns the RADEON 8500LE. The advantage over the GeForce2 Ti is really striking, and even the MX440 was able to outdo the latter though they belong to the same price niche. 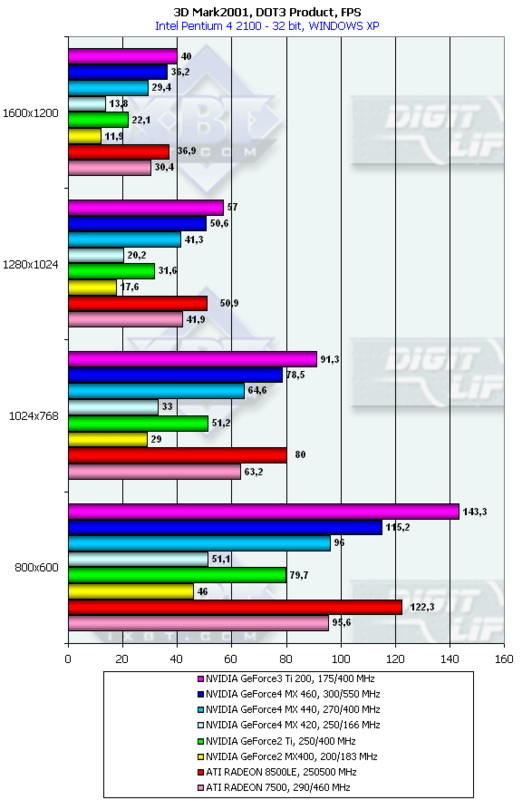 It is interesting that the junior MX420 leaves the GeForce2 MX400 far behind. 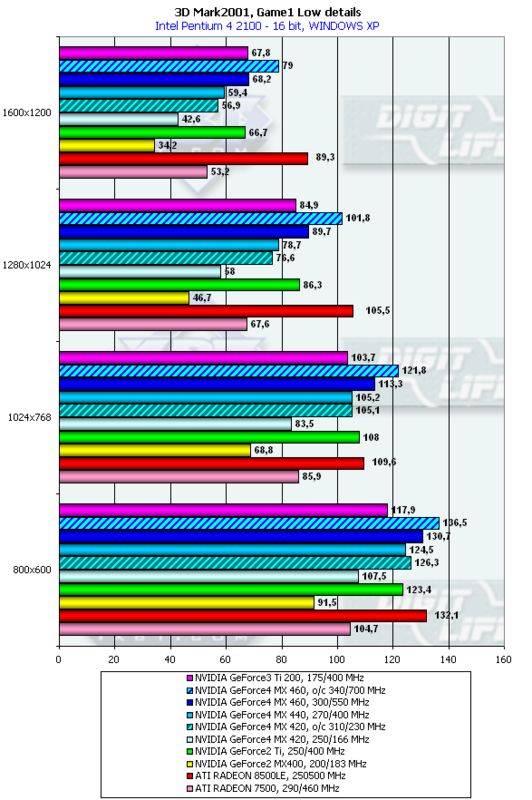 The RADEON 7500 was easily beaten by the new card on the GeForce4 MX440 which is cheaper at that (I mean the RADEON 7500 from ATI (290 MHz chip)). 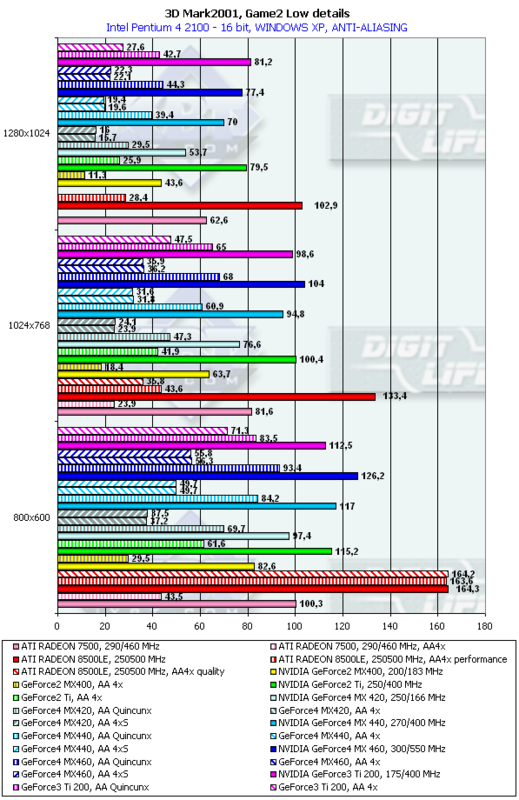 The RADEON 8500LE remains the king. In this test the MX460 looks weaker; in high resolutions it performed equally with the GeForce3 Ti 200 and in 1600x1200x32 it was even worse. 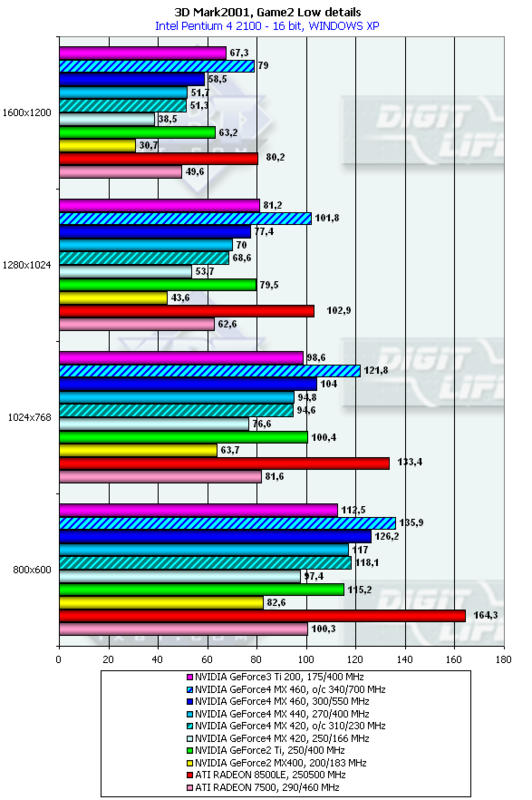 The MX440 is still stronger than the GeForce2 Ti. 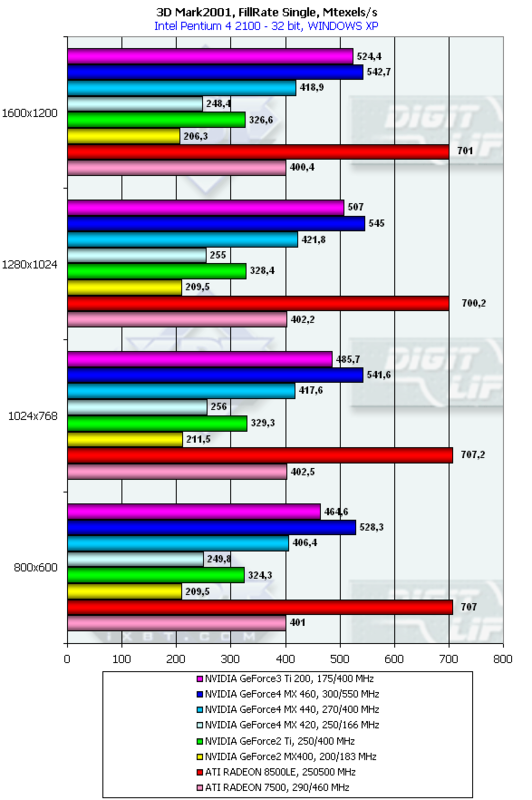 The HiperZ technology of the RADEON 7500 turned out to be rather effective in this test which has a high Overdraw factor, that is why this card was able to catch up with the MX440 in high resolutions. 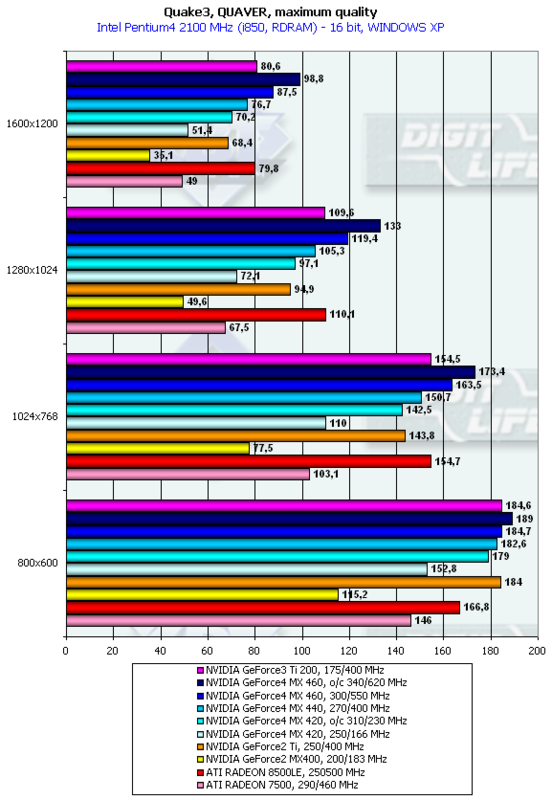 The RADEON 8500LE remains unconquerable. This test turned out to be the toughest for the new GeForce4 MX family. The MX460 falls behind the GeForce3 Ti 200. 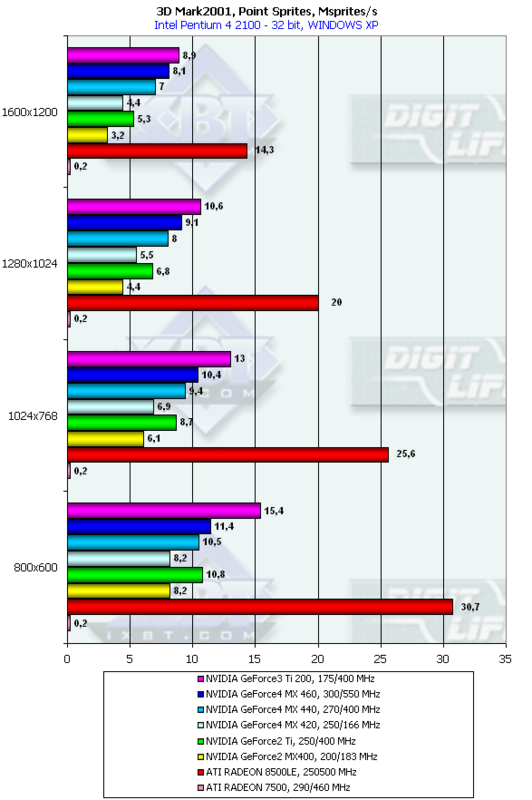 The MX440 still outscores the GeForce2 Ti, and the MX420 is able to beat the GeForce2 MX400. 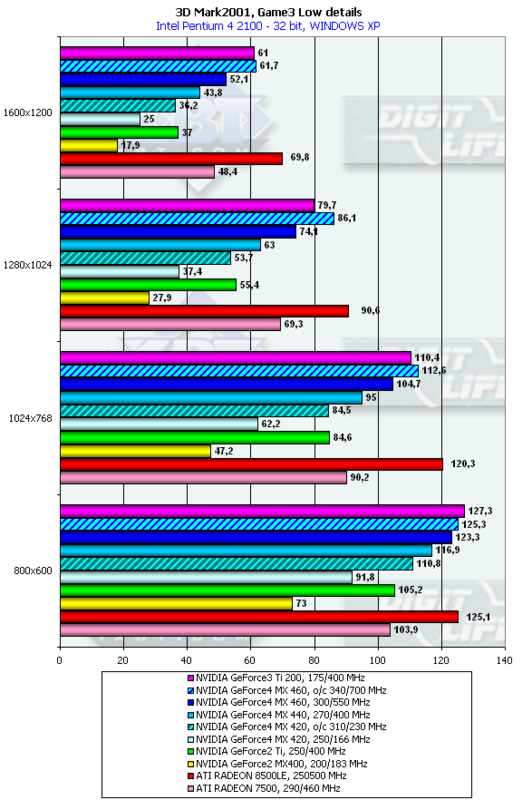 Besides, the MX440 loses to the RADEON 7500 (though it doesn't yield to it if we take into account their prices). Return to Castle Wolfenstein (id Software/Activision) - a gaming test which demonstrates operation of cards in OpenGL using Checkpoint benchmark. The tests with Quaver were carried out in 16-bit and 32-bit color modes at the highest detailing and complexity levels of geometry (r_subdivisions "1" r_lodCurveError "30000"). This benchmark loads accelerators with complicated geometry as well as with huge textures and a great deal of effects. First of all, let's estimate the performance decrease on a transition from 16-bit color to 32-bit one. As expected, the cards with SDR memory suffer most of all. 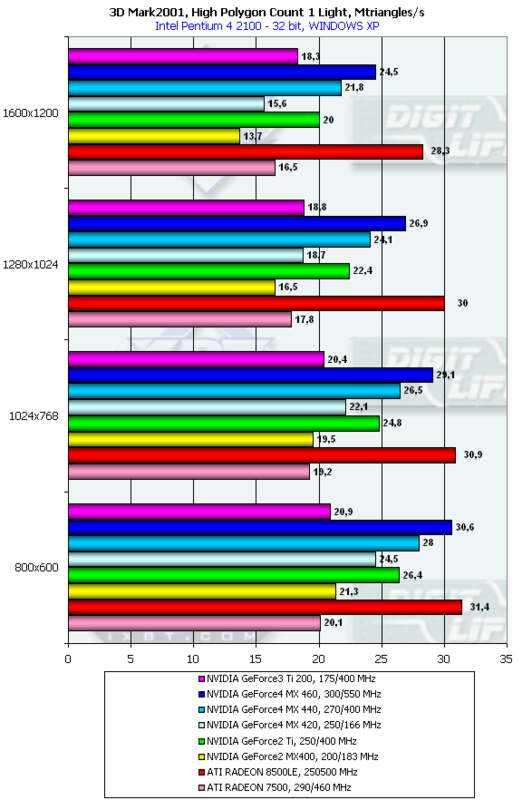 Optimization of the GeForce4 MX420 improved its position despite a worse correlation of the core and memory frequencies as compared with the GeForce2 MX400. 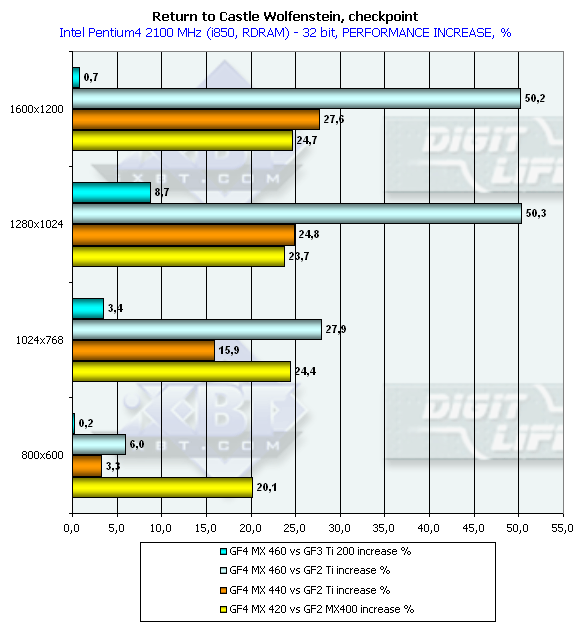 The GeForce2 Ti fails despite its DDR memory (200 MHz is still not enough to load up the 250 MHz 4-pipeline GPU). 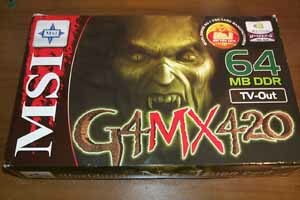 The GeForce4 MX performs much better with its DDR memory: it gets high results in 32-bit color. 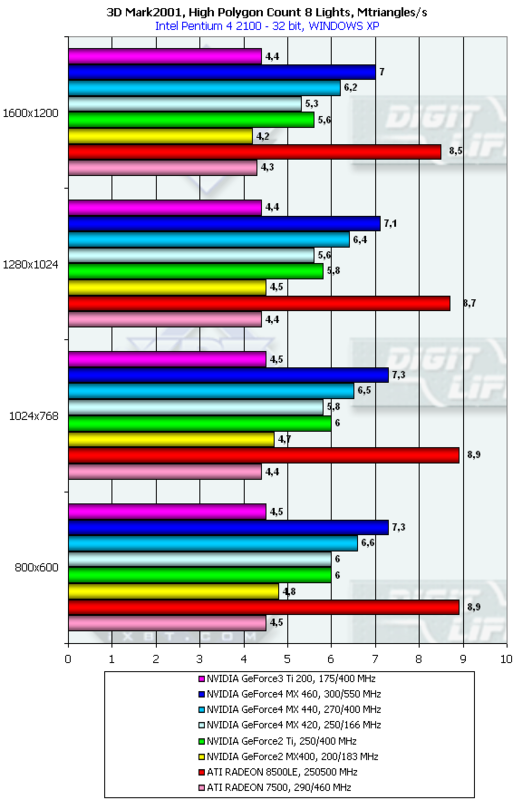 The ATI RADEON 8500LE loses to the GeForce4 MX460, and in high resolutions in 32-bit color the MX440 outscores it. 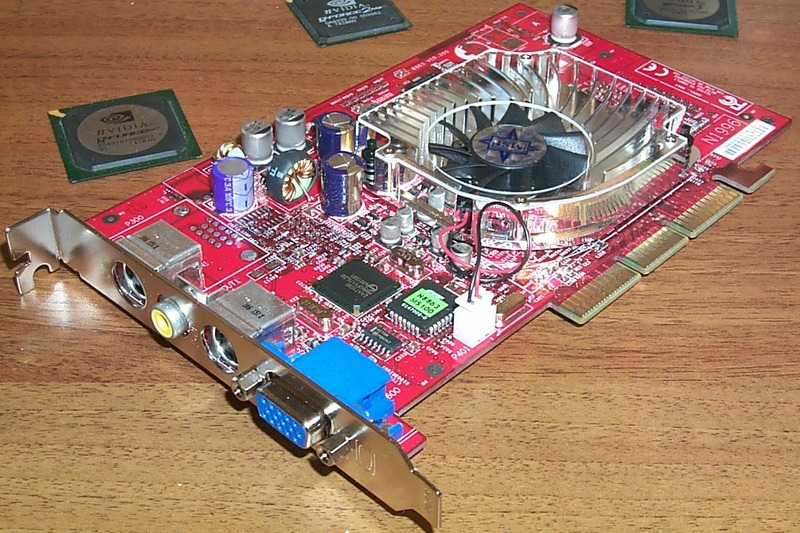 The RADEON 7500 is able to outrun only the GeForce4 MX420. 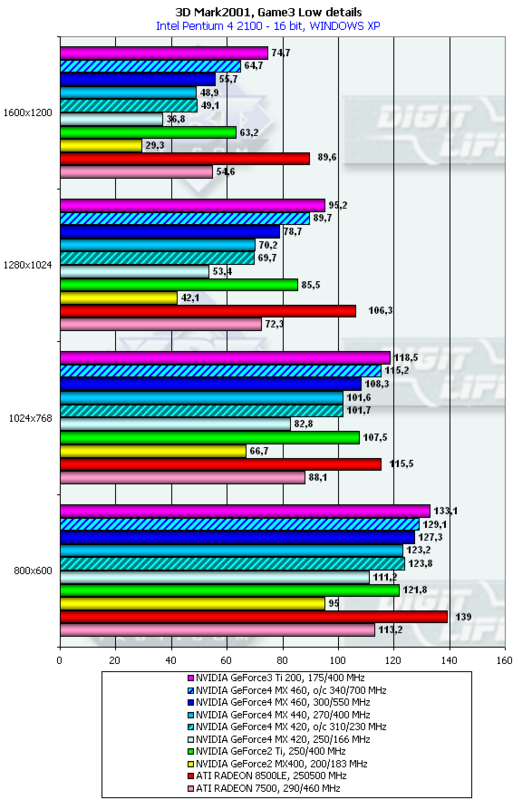 So, we can see that the MX460 beats the GeForce3 Ti 200, the MX460 and the MX440 outpace the GeForce2 Ti, and the junior MX420 trumps its competitor GeForce2 MX400 by 50%. The tests were carried out in 16-bit and 32-bit color at the highest detail and quality levels of textures. 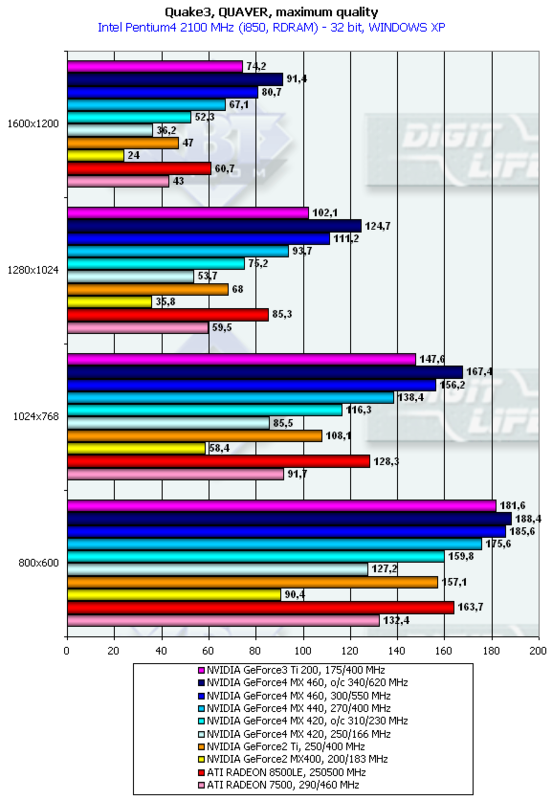 The RADEON 8500LE lose but only to the MX460. 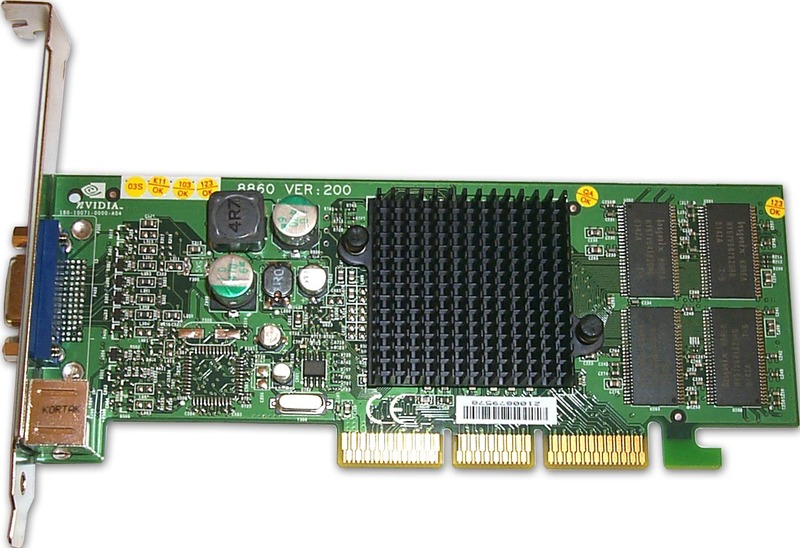 The middle card MX440 has different results in competing against the today's leader. 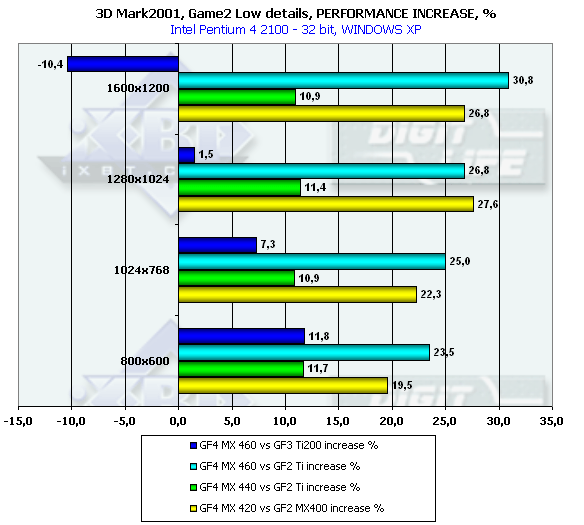 The GeForce4 MX460 goes on a par with the GeForce3 Ti 200, though the MX440 is still beating the GeForce2 Ti. A year ago NVIDIA applied a new AA method - Quincunx. It's fast and offers a high AA level; however, it makes textures blurry in many cases. 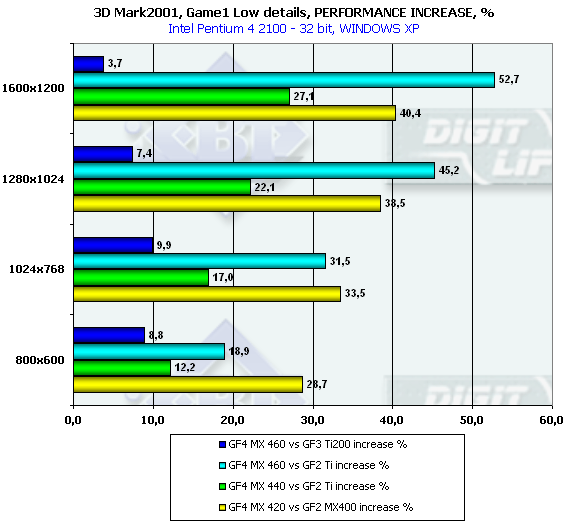 So, what can we say about the AA 4xS which appeared in the GeForce4? S1 is the first 2x1 subunit, and S2 is the second one. 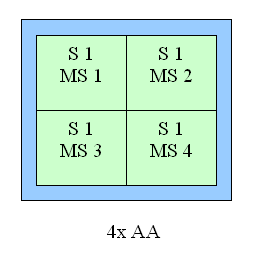 Samples are calculated according to the multisampling method inside the subunit, i.e. from one selected texture value, but texture values can differ in upper and lower subunits, unlike in a usual 4x MSAA. From the accelerator's standpoint we just calculate a vertically doubled image in a standard 2x MSAA mode (2x1 units). This mode can also be set up in the NV20 but only through undocumented driver parameters in the register. The GeForce4 Ti based cards allow making this setting in the driver's control panel. It should be noted that the GeForce4 Ti performs excellently: although the number of interpolated texture values is now twice larger, the performance differs from the 4x by just a couple of percents, and visual quality is much better. This method can't improve the situation considerably on polygons' edges - SSAA and MSAA look similar there, but textures must be now less blurry. It is interesting that on the NV25 and NV17 chips right samples move down by a half of the screen pixel, thus forming a parallelogram with two others. This scheme becomes symmetrical relative to vertical and horizontal directions, and this method implements some of the anisotropic filtering functions (2x quality) for horizontal surfaces (landscapes, floor, ceiling). 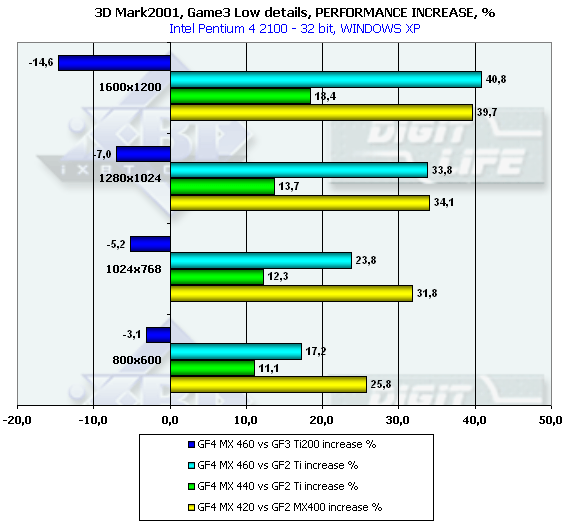 In the GeForce4 Ti review we closely examined quality obtained with different AA types. And now let's see how much the speed falls down with different AA types enabled. 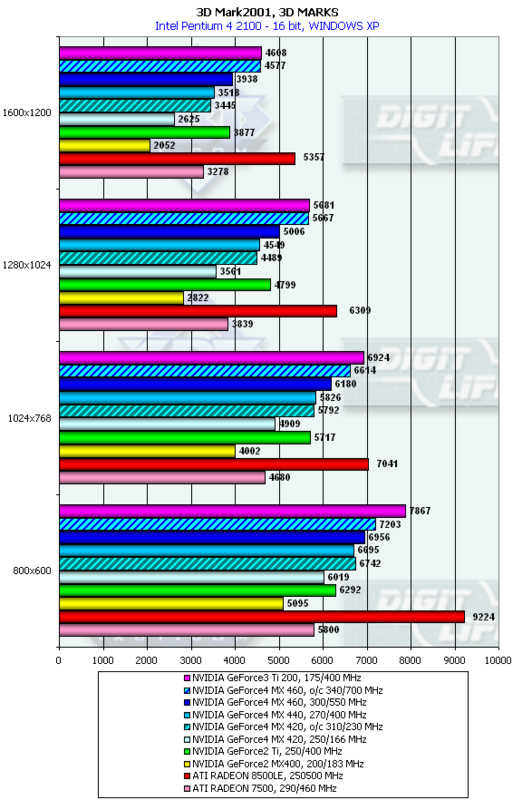 The MX460 and MX440 are fighting successfully against the GeForce3 Ti 200 in the Quincunx mode, and in the 4x mode they beat the RADEON 8500LE and the GeForce2 Ti in 1024x768. The situation is more favorable for the RADEON 8500LE, but the Quincunx mode saves the GeForce4 MX from the defeat. 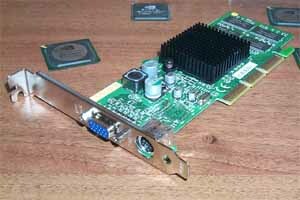 In the 4x level these cards can compete against the GeForce2 Ti everywhere, and only in 1024x768 against the RADEON 8500LE. The situation is similar to the previous one. It is obvious that the GeForce4 MX is going to successfully replace the GeForce2 series. The new solutions have some advantages over the GeForce2 Ti/Pro/MX400 (we wrote about it in the beginning of the article). The price can really be high, but it mustn't exceed 10-15% over that of the GeForce2 Ti/Pro/MX400. While the GeForce4 MX440 and MX420 are successfully competing against the earlier released products (or those from ATI) in their price niche, the GeForce4 MX460 demonstrates contradictory results: it will be priced close to the GeForce3 Ti200 which has some advantages in modern 3D functions support (pixel shaders, EMBM, 3-level anisotropy etc.). The dual-head support of the MX460 can be a determining factor. The previous suggestion concerning the MX 460 will be true if the manufacturers do not make the cards cheaper or equip it with a slower memory (in this case the card will lose to the GeForce3 Ti 200 in all respects). The ATi RADEON 8500LE looks like a leader, but its future depends on the price war with the MX460. 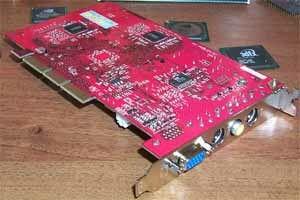 Besides, production of slower (230 MHz) cards also named as RADEON 8500LE might affect the situation. 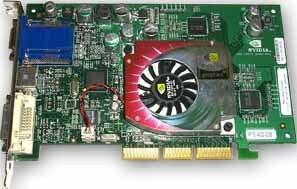 The junior GeForce4 MX420 is cheap in production and is close in this respect to the GeForce2 MX400, that is why we can expect that their price won't go up. 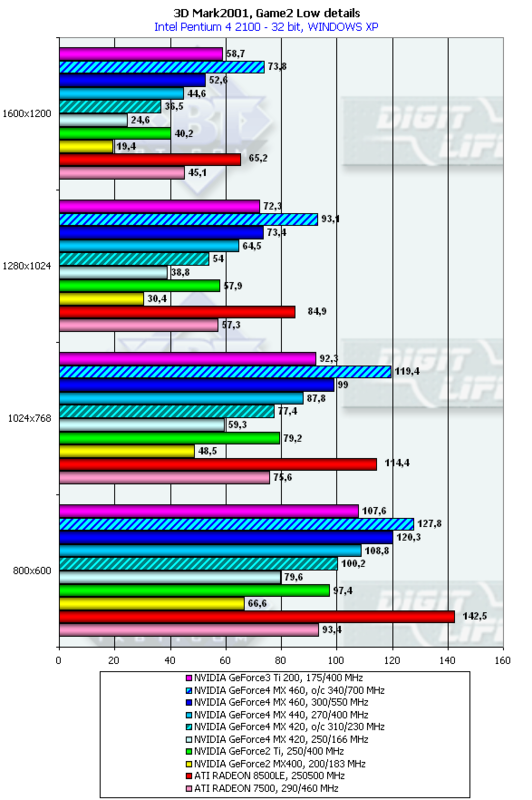 And it obvious that the MX420 is smarter than the MX400. It's the first time when mainstream cards on the NV17 have almost a free AA for the most of modern gaming applications. I hope the price policy of NVIDIA and its partners will be competent and will let the old solutions on the GeForce2 family be taken out and replaced with the GeForce4 MX; at the same time the GeForce3 should be later replaced by the GeForce4 Ti line. In this case the users with a GeForce4 MX460 card won't be disappointed on finding out that the cheaper GeForce3 Ti 200 card has more functions (shaders, 32-pixel anisotropy).